Although ironweed (Vernonia spp.) is not exactly an unknown perennial, it certainly doesn’t have the popularity it deserves. It’s one of those plants you see in plant nerd’s gardens and in those public gardens that have an “in-the-know” gardener behind the scenes, the kind of plant you find strikingly attractive, but just can’t put a name on. I think it’s time for us plant geeks to change that. 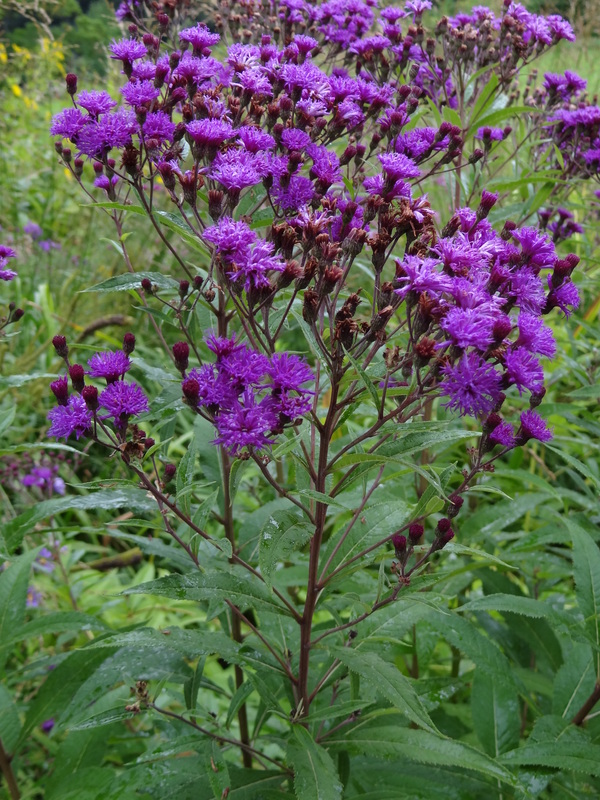 i’ve been growing ironweed for a number of years now, first New York ironweed (Vernonia noveborecensis), at the time, the most widely available species, then others. 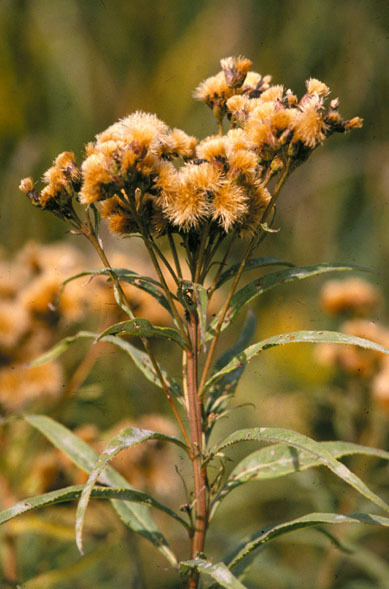 North American ironweeds are mostly upright, clustering perennials with strong stems forming a somewhat flaring clump. They bear long, lance-shaped, dark green leaves all the way up an often reddish stem and, for about 6 weeks somewhere between August to October, depending on your local climate, clusters of fuzzy purple flowers at the top of the stems. Actually, the “flower” isn’t really a flower, but an inflorescence, a cluster of much smaller flowers forming a tight head. Unlike many other plants in the Aster family, ironweed inflorescences have no rayflowers (the broad “petals” of daisies, black-eyed Susans, and sunflowers). Instead, all the tiny florets are narrow and tubular… and all are the same purple colour. Clustered flowers almost always attract butterflies and that is certainly the case with ironweed: it is one of the best butterfly plants for the end-of-summer/fall garden. Rusty brown seed heads of Vernonia fasiculata add winter interest and attract birds. I always assumed ironweed got its name because its tough stems never flop. Some botanists agree with that theory, but others suggest the name is due to the rusty brown colour of the fuzzy seed heads that follow the plants bloom and hang on into winter. The fact is no one knows why early North American colonists gave this plant its common name. The origin of the botanical name, though, is known: it honours William Vernon, a British botanist who collected plants in Maryland in 1697 and 1698… and brought back the first ironweeds to Britain. 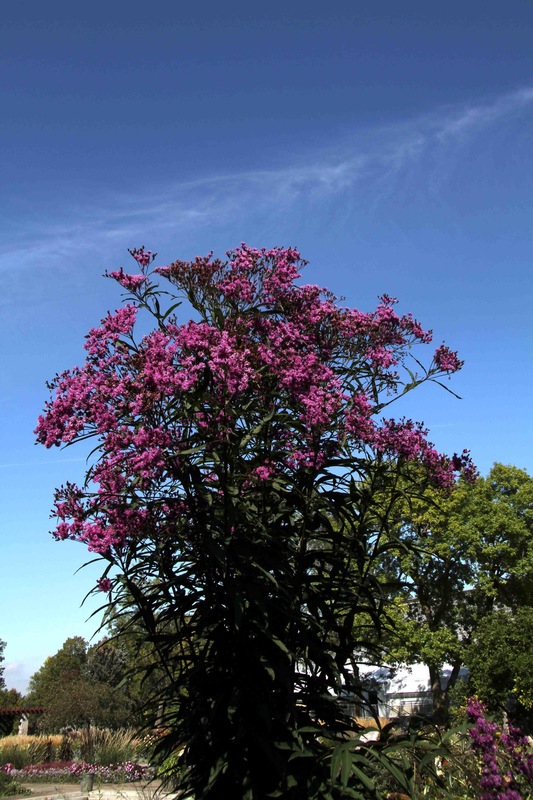 The genus Vernonia is a huge one, with over 1,000 species, including trees, shrubs and perennials, and is found in Asia, Africa and North and South America. 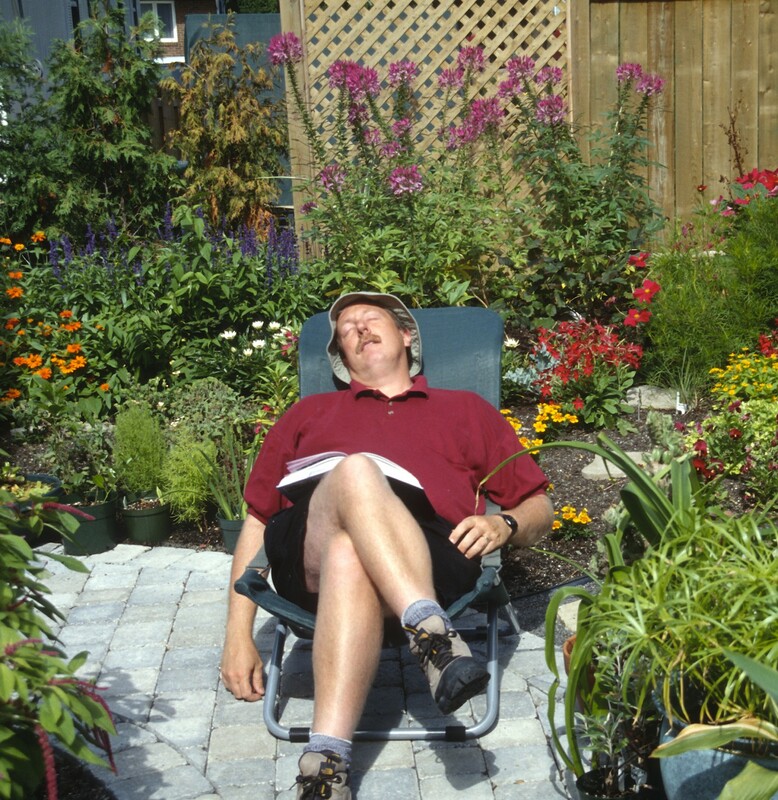 The species that will interest northern gardeners, though, are all hardy perennials, with no shrublike qualities, and are from the North American branch of the genus, a group of some 20 species. All have the same fuzzy purple flowers and are best told apart by their height and foliage characteristics. The first species to be commercialized was the New York ironweed (V. noveboracensis), native to the east coast of the United States. It is a tall as perennial perennials go, averaging 4 to 6 feet (120-180 cm), but you’ll soon see that that is only of intermediate height for a vernonia. It is hardy to zone 3. Prairie ironweed (V. fasiculata) is not that different from V. noveboracensis, although a bit smaller on average (3 to 4 feet/90-120 cm). As the name suggests, it is native to the Prairies as far north as Manitoba. 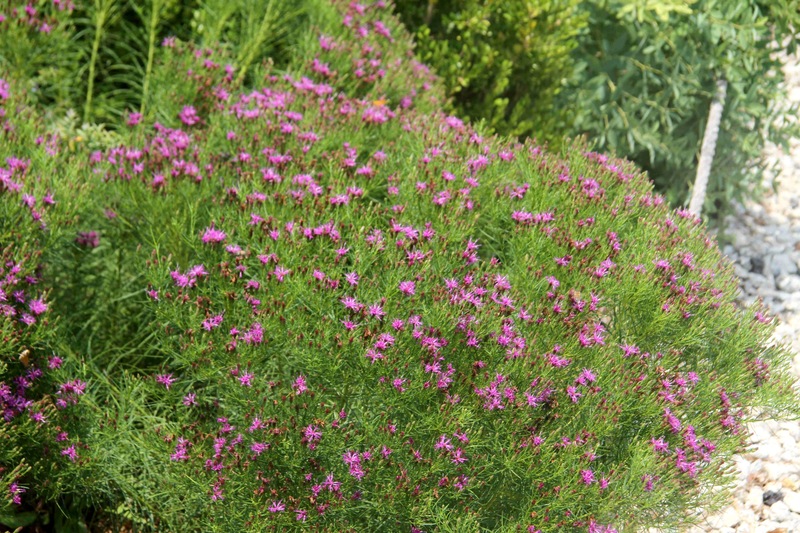 It is the most drought-tolerant of the ironweeds. Zone 3. Arkansas ironweed (V. arkansana) is not as limited in its distribution as the name suggests, but rather is a species of US Midwest states. It is often sold under the name V. crinita. It has broader leaves than most ironweeds and attains 4 to 6 feet (120-180 cm) in height. The best known cultivar V. a. ‘Mammuth’, which, as the name suggests, is a taller selection, up to 7 feet (210 cm). Zone 3. The tallest of the ironweeds is called, appropriately, giant ironweed (V. gigantea, formerly V. altissima). It can reach from 5 to 10 feet (1.5 to 3 m) in height: a true giant among perennials! It is the most upright vernonia of all, almost like a pillar, and therefore less vase-shaped than the others. Also, it has broader, longer leaves than other ironweeds… but still the same purple flowers as its cousins. Give this one moister soil than the others or supply a bit of shade: in the wild, it tends to be a woodland species and doesn’t like to dry out. It has a very wide distribution in nature, throughout the eastern half of the US and into Ontario. There is a cultivar, ‘Purple Pillar’, which seems to be identical to the species. Zone 3. 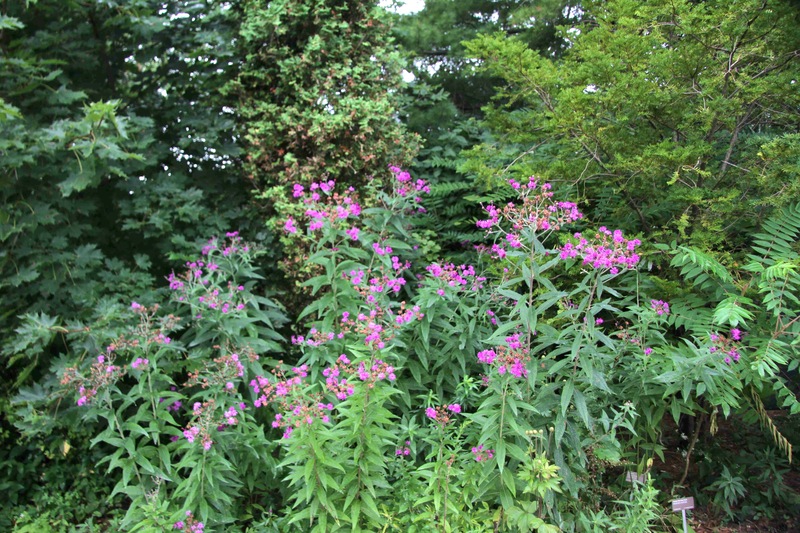 Narrowleaf ironweed (V. lettermannii) breaks most of the ironweed rules. First, it is fairly short, only about 2 to 3 feet 3 inches (60 to 100 cm) tall. Its leaves are very narrow indeed, almost threadlike, and very numerous, giving this plant a very ferny look. Also it forms a much more rounded plant than the other ironweeds, with a distinctly less upright silhouette. Narrowleaf ironweed is very rare in the wild, found only sporadically in Arkansas and Oklahoma, but is quickly becoming the commonest ironweed in gardens, especially the cultivar ‘Iron Butterfly’. The latter actually doesn’t differ much from the wild form, except that it is of a more stable height: about 3 feet (90 cm). Zone 4. As the name suggests, ironweeds have an ironclad constitution. They are tough and sturdy, never requiring staking, and, in fact, need essentially no care other than trimming the old stems back in spring (leave them up all winter: they’ll attract seed-eating birds!). In the wild most species are found in grasslands and abandoned fields in average to fairly rich soil. In the garden, they’ll prefer full sun to no more than partial shade. They do fine in the richly amended soils of most gardens, but won’t fuss if you plant them in plain old “dirt”. 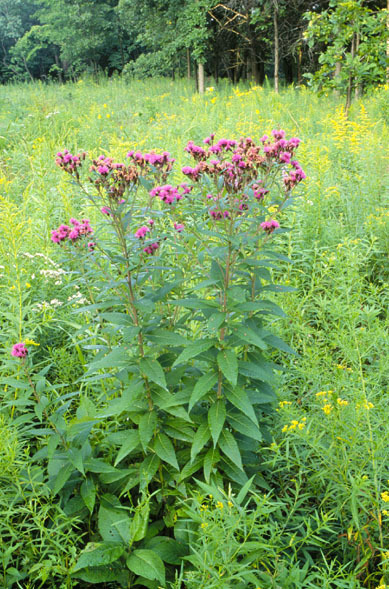 Ironweeds are drought-resistant to a certain degree (especially prairie ironweed), but prefer fairly even moisture. They’re not considered invasive, but they may produce a few offsets over time and all can self-sow, but usually only do so to a limited degree. The most obvious way to multiply ironweeds is by division, best done in spring, but they also sprout readily from stem cuttings taken at the same season. Seed germinates readily if you sow it outdoors in the fall. If you choose to sow it indoors, after sowing, place the pots in a sealed plastic bag and refrigerate for 2 months, as they need a period of cool temperatures and moist soil conditions in order to stimulate germination. When the 2 months are up, expose them to light and the seeds will soon sprout. You’ll find that better garden centres now offer ironweeds (V. lettermannii ‘Iron Butterfly’ is becoming particularly popular), but if you can’t plants locally, try mail order sources. Easy, colorful and tough-as-nails, ironweeds deserve a place in every garden!